Unique to Russia settled animals at the zoo in Yekaterinburg. According to "UralInformByuro" is rodents, Patagonian maras and Steve Jobs. They moved to a zoo of Novosibirsk October 5 - the day when the founder died Apple , and new residents, it was decided to name after him. As described in the Department of Public Relations Yekaterinburg Zoo, while the rodents are in quarantine. Acquainted with them will be in mid-November. Later, Steve Jobs or exchanged for a female for a couple, says "UralPolit.Ru" . 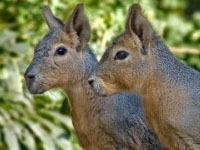 Patagonian maras originated in Russia and a half years ago. This is the fourth-largest rodent in the world, after capybaras, beavers and porcupines. Its growth reached half a length - meter. Maras are found in subtropical South America and the Argentine pampas. In captivity they live up to 14 years. As the JustMedia , rodents eat grasses and grains. Earlier it was reported that in Yekaterinburg in the zoo's oldest hippo died Russian nicknamed Diamond. He also was one of the oldest hippos in the world. 36-year-old animal has recently suffered from some chronic age-related diseases. Exact cause of death will be called after opening the specialists of the Department of Veterinary Medicine of Sverdlovsk region and the Agricultural Academy. "For the hippo he lived a long life and was one of the ten most mature members of their kind in the world" - told in the city zoo. On average, hippos live 20 to 30 years in captivity, males live to be 15-17 years. Age of individuals still alive in zoos Russia from 15 to 20 years. In the capital of the Urals Diamond brought another "baby" of Kaliningrad.